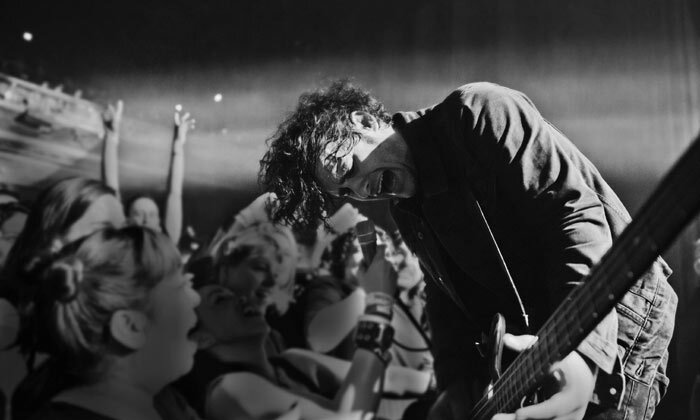 It’s hard to believe that over 16 years ago Black Rebel Motorcycle Club came to the shores of the UK and supported Oasis at Finsbury Park, instantly making an impact. Every time they’ve returned, they’ve left a lasting mark. A true rock ‘n’ roll band that knows their roots and never step away from that. Tonight, BRMC are back at the venue with the stickiest floors in the UK, Rock City. The stage floods with strobe lights and copious amounts of smoke, and the band hit out straight away with their new track ‘Little Thing Gone Wild’; a typically upbeat number that suggests good things for their upcoming album. Their next offering was rather spoiled by an unflux of chatter from the audience, but through the disturbance they played an enjoyable mix of the old and the new, smashing out ‘Berlin’ and the brilliant ‘Conscience Killer’ then sliding in a couple of new ones: ‘Haunt’ and ‘Question Of Faith’. They offered quite the treat with renditions of ‘Love Burns’ and ‘Stop’. The last four songs of the night are beaten out in quick succession; `Six Barrel Shotgun’, ‘US Government’, `Spread Your Love’ and ‘Punk Song’. This is what Black Rebel Motorcycle Club are about. It’s rock ‘n’ roll at its best and proves that guitar music ain’t dead. After two hours, the trio do just one song for their encore; another new one dubbed ‘Half State’. It’s just brilliant, and shows that these three are still bringing fresh ideas to the table.